Heartland Center is hosting an ongoing program by the Serenity Life Resource Center to provide equine therapy on our campus. Equine Assisted Psychotherapy is an avenue of counseling that can be beneficial for almost any area of life that involves relationship with self or others. The experience of establishing a relationship with the horse brings a hands-on, active ingredient for growth, change and healing that talk therapy alone does not offer. This therapy can be used in all of the following areas and more: relationship counseling, trauma healing, addictions, boundaries and assertiveness, grief and healthy living. Certified therapists customize treatment to address specific therapeutic goals of each client. Horses can provide a foundation for healing to begin because clients can relate to and interact with horses in ways that often prove difficult for them when it comes to people. Through building a relationship with horses, clients gain insight into their own verbal and nonverbal behaviors, as well as behavioral and relationship patterns. Horses will not demonstrate acceptance, trust and respect in a relationship until the client learns to do so. This allows the client to take responsibility for the kind of relationships they build with the horse and, ultimately, in their life. From the beginning, a dedicated, faithful and caring summer staff have played a crucial role in making camping programs here at Heartland such a success. What you may not know is that a group of these staff alumni have joined together to form the Staff Alumni Giving Circle. They pool together donations in order to make big improvements at the camp. In this way, those who have already given generously of their time and talents to serve as staff can continue to make a difference in the lives of young people. Giving Circle members and camp leadership provide project ideas and those who have donated funds get to play a part in deciding how the donations will be used. A steering committee, made up of former staffers, volunteers the time to coordinate the Giving Circle activities. The Giving Circle made the Water Walkers possible; these are a favorite, fun pool activity. 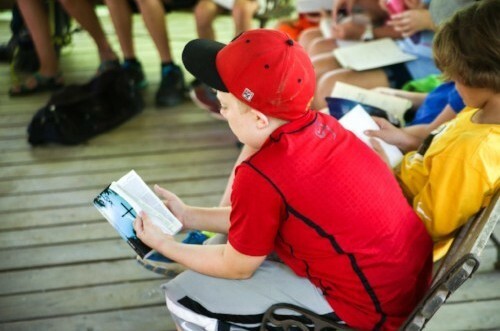 It has also enabled Heartland to provide each first time camper with a Heartland Bible; this has proved to be a wonderful blessing, especially for those who have never had a Bible of their own. We are thankful for the blessings that are provided to Heartland Center through staff alumni. They witness to the impact the Christian camping experience has on young people, who learn the good news of Jesus Christ, come to know that they are loved as a child of God, and have a wonderful, joyful time. A record number of people are participating in the August 4-5 celebration of the 60 years of impactful camp and conference ministries of Heartland Center. Hope to see you there! If you would still like to register, go to our Website. What Day Campers are Saying . . .
“My favorite thing about camp was " all of it!" Consider leaving a legacy with Heartland Center through your estate planning.